The Leadership Challenge is the gold-standard manual for effective leadership, grounded in research and written by the premier authorities in the field. With deep insight into the complex interpersonal dynamics of the workplace, this book positions leadership both as a skill to be learned, and as a relationship that must be nurtured to reach its full potential. 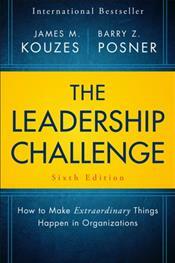 This new sixth edition has been revised to address current challenges, and includes more international examples and a laser focus on business issues; you'll learn how extraordinary leaders accomplish extraordinary things, and how to develop your leadership skills and style to deliver quality results every time. Engaging stories delve into the fundamental roles that great leaders fulfill, and simple frameworks provide a primer for those who seek continuous improvement; by internalizing key insights and putting concepts into action, you'll become a more effective, more impactful leader. A good leader gets things done; a great leader aspires, inspires, and achieves more. This book highlights the differences between good and great, and shows you how to bridge the chasm between getting things done and making things happen.